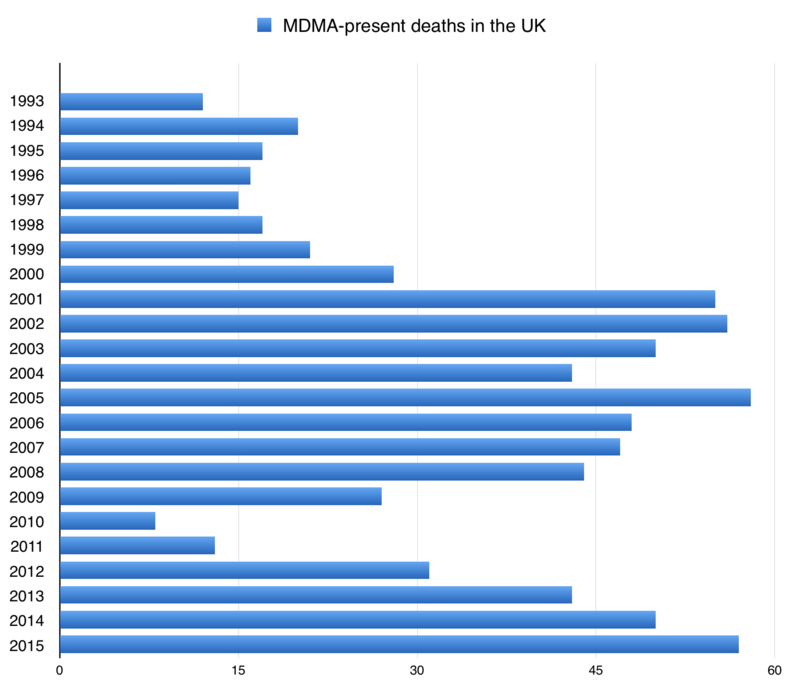 In one study in the UK, of 81 deaths where MDMA was present, only six died from simple MDMA toxicity/overdose. 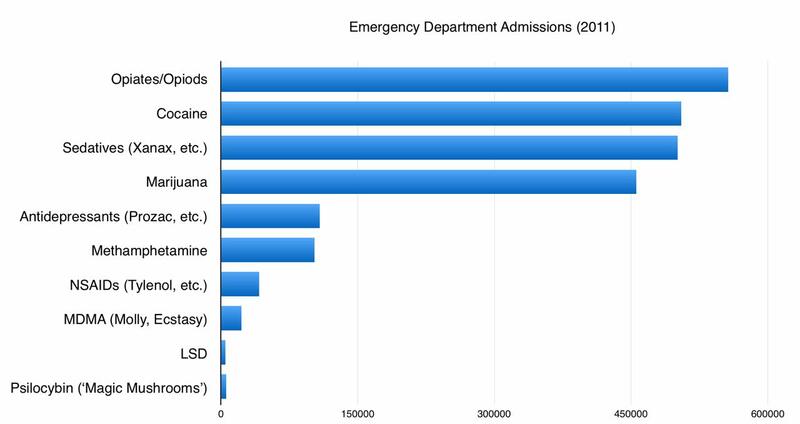 The leading causes of actual MDMA-related death are complications of “malignant hyperthermia/hyperpyrexia”…what most people would call Heatstroke. Perhaps the second most common cause of death (significantly less common than heatstroke-related) is Hyponatremia, sometimes called “water intoxication.” Even rarer causes of death are due to underlying health problems (heart disease, etc.) being aggravated by MDMA’s stimulant effects and a few ‘misadventure’ deaths (falls, etc.) Fatal cardiac arythmias have been claimed, but seem to be unreported in the case studies. Equally important in considering risks is that, while being a pack-a-day cigarette smoker is always dangerous, most of the people that died as a result of their MDMA use did something extra to cause their demise. An informed MDMA user is unlikely to be a hyponatremia death. No responsible MDMA user is likely to be a ‘driving under the influence’ or drug mixing death. Some people have objected to this comparison, saying that one beer or one cigarette is not as dangerous as one pill of MDMA. While that’s true, my interest is (quite justifiably, I think) the overall risk posed by the lifestyle, not per-unit risks. Yes, smoking a single cigarette is probably safer than taking one ecstasy tablet, but that’s not the way real world users behave. The smokers don’t stop at just one cigarette and the drinkers don’t stop at just one beer. The statistics shown here mean exactly what they say: Your odds as an MDMA user of being killed from your MDMA use are a very small fraction of your odds as a smoker or drinker of being killed as a result of your smoking or drinking. 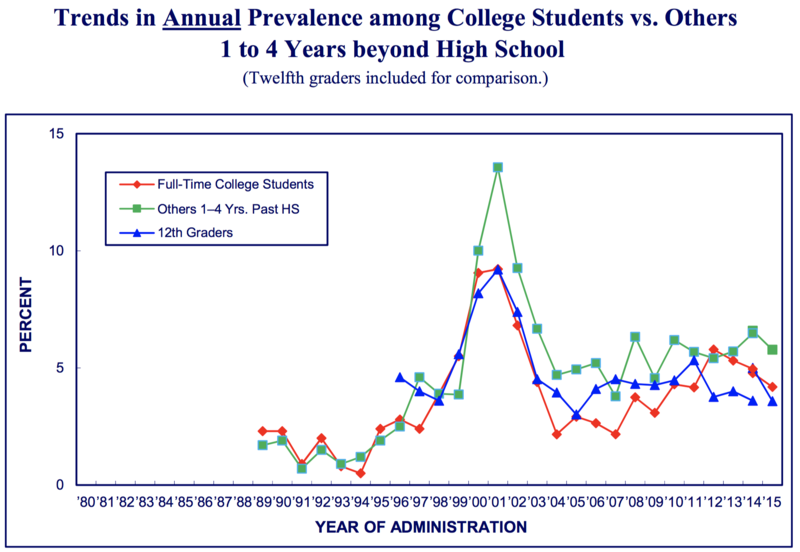 As shown in this graph from the Monitoring The Future survey, use of MDMA by teenagers and young adults saw extremely strong growth in the late 90’s, with use by high school seniors more than doubling just from 1998 to 2000. 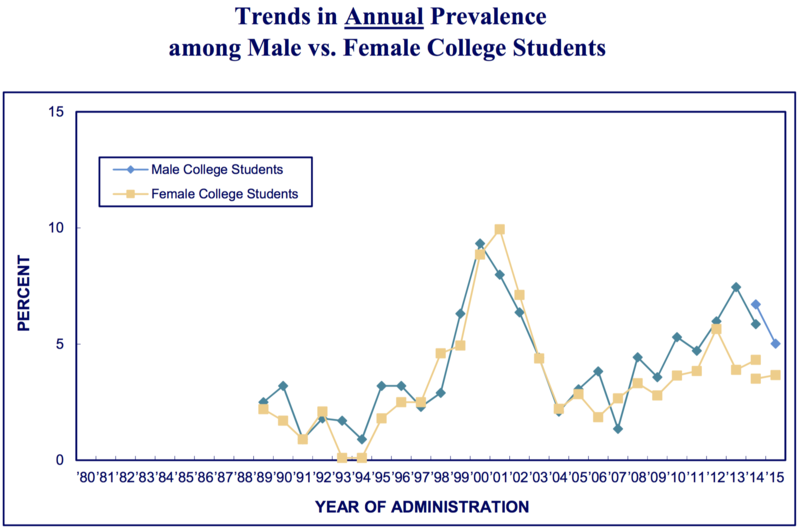 Apparently the initial surge of popularity wound down in around 2003. Usage levels have since settled down into a fairly consistent last-year usage rate of around 4-5%. 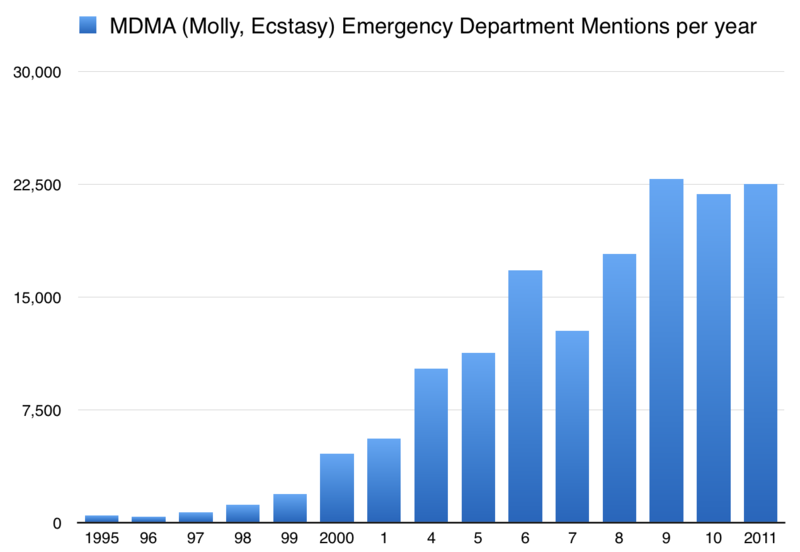 As validation of the surveys, the 2002 drop is consistent with declines in MDMA-involved emergency room visits for 2002. Generally, men are more likely to use drugs than women, but for MDMA the effect is relatively small, showing a similar level of appeal to both sexes. 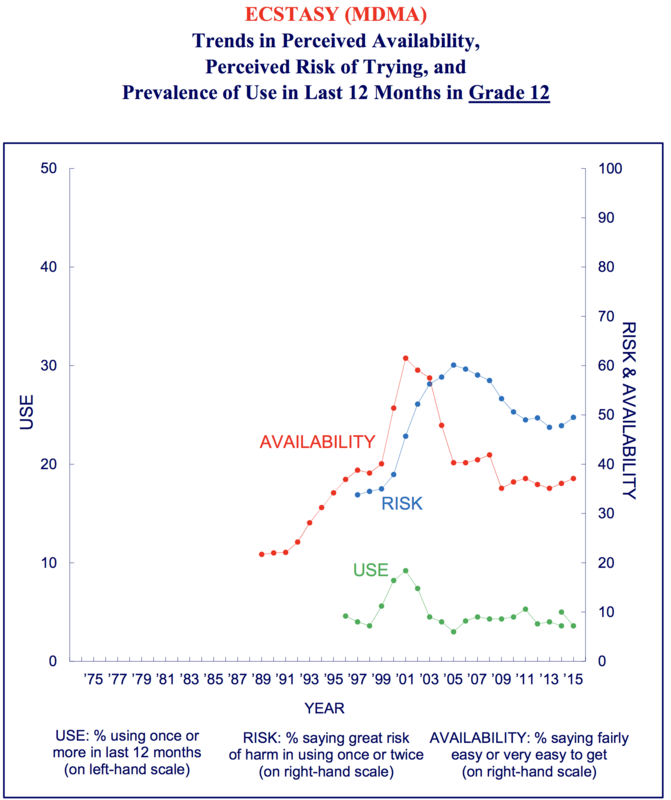 Interestingly, MDMA usage rates correspond much more closely to availability, with relatively little apparent effect from the public’s perceived risk of using MDMA. The percentage of young adults (ages 18-30) who believe trying MDMA “once or twice” would be harmful has been remarkably consistent, hovering around 50%. This may represent a general wariness of drugs rather than specific opinions about MDMA. • Males are somewhat more likely to have used MDMA than females. • Major cities had ~60% more past-year use than small towns.